A district literacy coach and good friend recently asked our students (through our Edmodo page) for book suggestions for a group of middle school students with whom she was working. First of all, I was honored and impressed that she was looking for recommendations for her middle school students from our 5th graders. Second, I was impressed with our students' responses to her. They provided titles and authors and even kept certain types of readers in mind ("Maybe middle schoolers would like Out of my Mind. I think they would like to read Out of my Mind because it tells you how to react with kids that have a disability. This book also tells you how those kinds of people with disabilities would feel when you react a bad way when you see them."). However, as the conversation continued, I was horrified when I read one particular student response. "I don't know what kind of books I like. You'll have to ask Mr. O'Neill." WHAT HAVE WE DONE?!?!? My panic began. We're creating "readers" who are completely dependent upon myself and my co-teacher! We're building students who are readers during the school year and may never read again! They will read from August until May and never pick up another book unless it has been assigned to them; and even then, they probably won't read it! I couldn't get it out of my head. "I don't know what kind of books I like. You'll have to ask Mr. O'Neill." The comment stayed with me; haunted me until we could meet in a conference. Now, the student who made the comment has read some incredible titles this year and she certainly enjoys to read. However, she obviously doesn't feel like she knows herself well enough as a reader or is confident enough as a reader to verbalize or perhaps to classify her favorite types of books. We certainly help our students find great titles at the beginning of the year and share books with them throughout the year, but we also hope to gradually pull some of that support back as the year progresses so that they can become more independent with their selections. When this student and I met, she was able to rattle off all of the books she had read so far this year without referencing anything in her notebook. The books have impacted her and stayed with her. As she told me each title, I wrote it down on its own sticky note. She then ranked the books from her favorite to her least favorite and we discussed what she liked about each one. As we did this, we grouped books together when she saw that they had something in common. She then responded again on Edmodo. Her response is below. "Well, I like books with strong friendship, characters persevering through some troubling times and I also like books with strong family relationships. 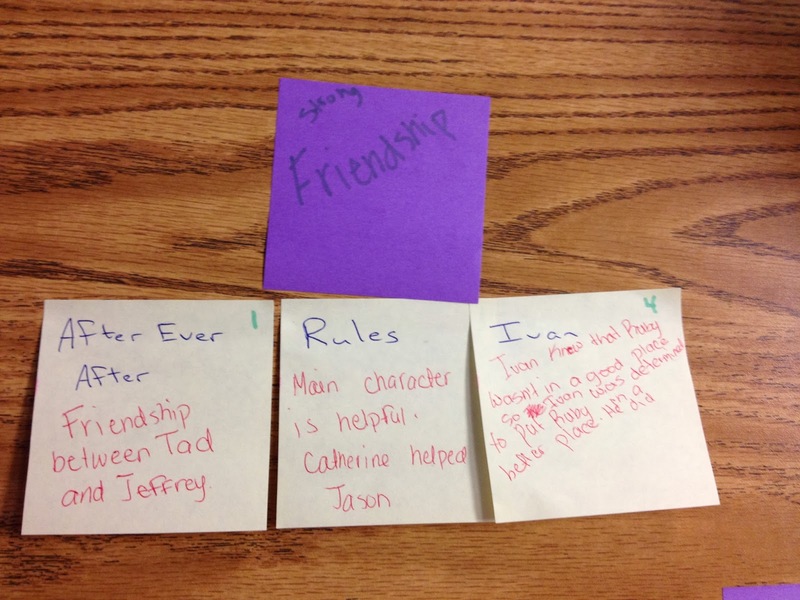 Some books with strong friendships are After Ever After, The One and Only Ivan, and Rules. 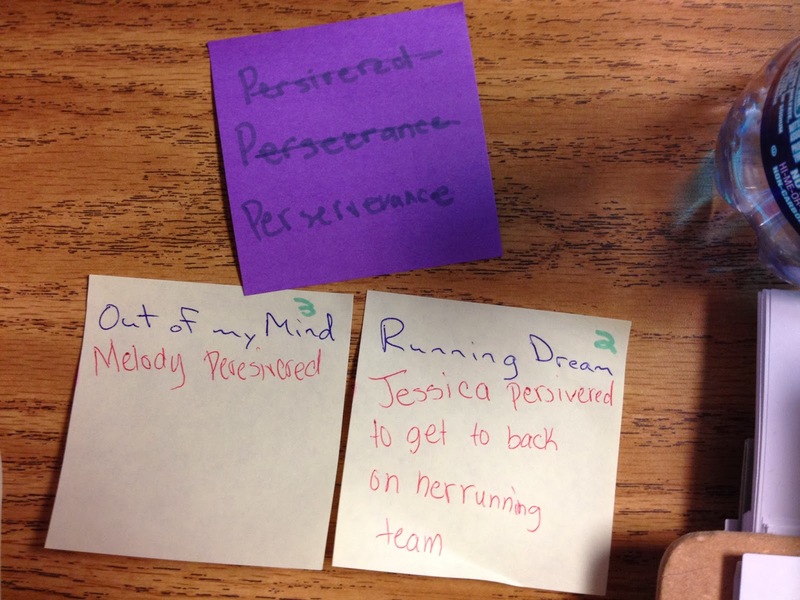 Some books with characters persevering through something are Out of my Mind and The Running Dream. The Wednesday Wars, I did not like because it had no action, was not funny, no one came from a different family, and no one persevered through anything." 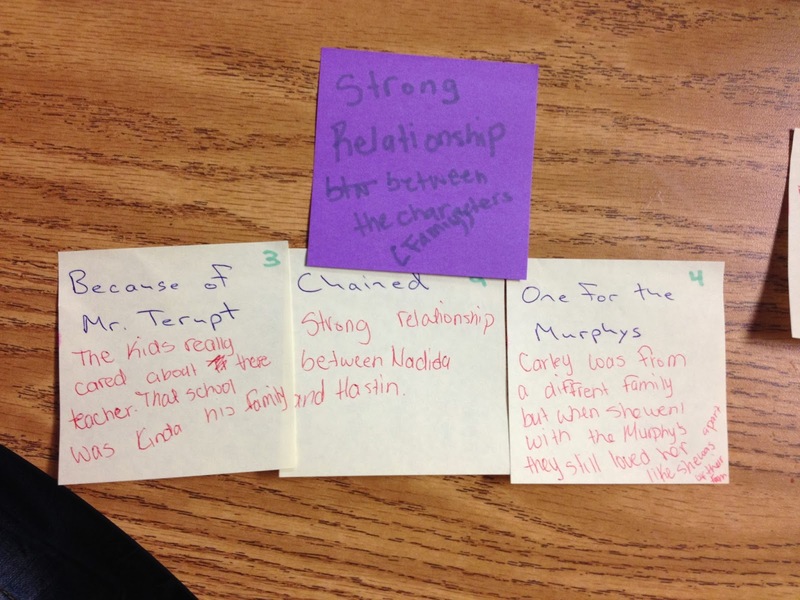 While readers could certainly disagree with this student's opinion of certain books, it is clear that she now has been able to identify what she liked about the books she has read and will use this new knowledge to assist in previewing and selecting books in the future.